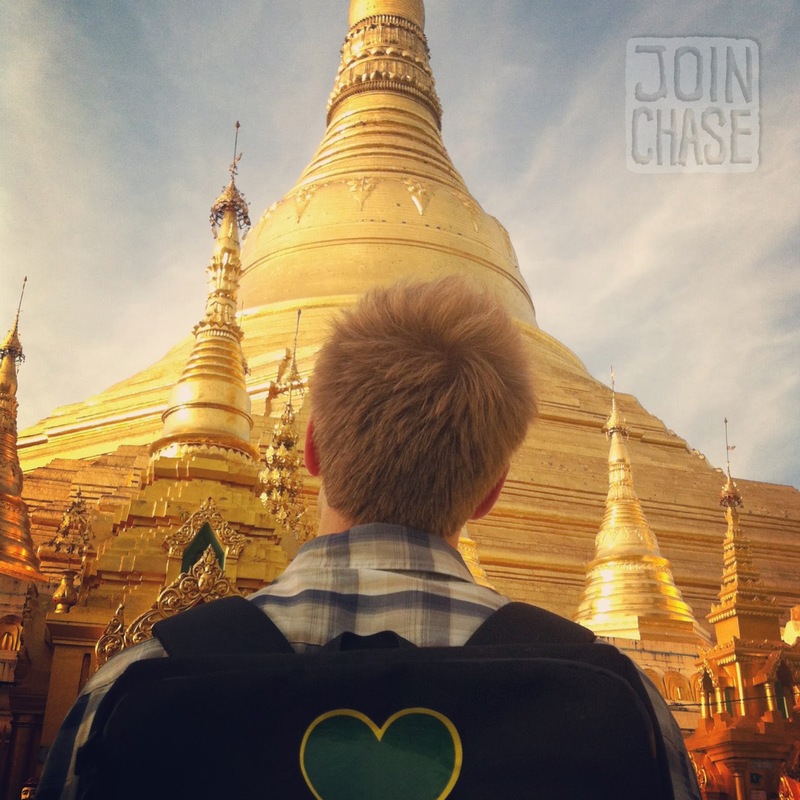 At the Shwedagon Pagoda in Yangon, Myanmar, sporting a green heart for Greenheart Travel. November, 2013. Nighttime in Yangon is my favorite. Lanterns and brightly colored bulbs hang overhead, making even the most desolate neighborhoods seem magical and inviting. Darkness’ coolness is a welcomed refresher after long, hot afternoons. 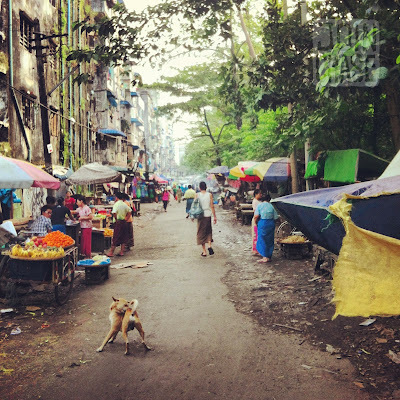 Kamayut Township in Yangon, Myanmar. November, 2013. A glimpse into the lives of locals can be caught, if you don’t watch your feet when you walk. Brightness from living rooms pours out open doors and windows. Families huddle around small tables for dinner. Laundry is strewn about balconies in every which way. Corner markets brim with freshness. Fish heads are chopped off right under the feet of passersby. Naked little boys hop up and down the road. Groups of men play chinlone with their longyis rolled up their thighs. All to the tune of a ceaseless stream of traffic buzz. A typical street in Yangon, Myanmar. November, 2013. Once again I find myself at a crossroads, the place between extreme poverty and unnecessary wealth. Somehow I'm allowed to have a foot in the door of both worlds, although I'm an outsider to both. One moment I'm sitting on a grimy plastic stool, next to a tiny, wobbly table, inside a house-turned restaurant eating lunch for less than buck. And then suddenly I'm whisked away to dine at one of the most luxurious hotels in the country. All because of circumstance. I enjoy the innocent stares and little smiles from people wondering what I’m doing here, what we’re doing here. Whether stopped behind slow-moving traffic, or walking through a supermarket, for a moment in time, connecting with someone so intimately, no matter how brief, is special. True curiosity on both ends, two people from different worlds, making eye contact for the first time, and quite possibly the only time, is beautiful. Yangon has already taken my heart captive. Its weathered and worn soul beckons me down each and every side street. The change it’ll experience in the near future is inevitable. Fortunately or unfortunately, I'll be a small part of that. I'm scared. I'm excited. I'm curious. I'm enthralled. This is where I'm supposed to be right now. I don't feel at home yet, but it seems as though I've already been here. In this place I’ll call home for at least the next year. This blog was written for Greenheart Travel. For more information about teaching in Myanmar, visit their website. 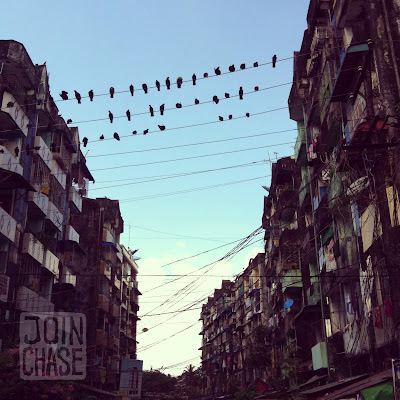 You can also follow my photo, video, and blog updates as a Greenheart Travel Teach Abroad Correspondent. Check out my longer, more informational version of this post on Expats Blog as well. The first picture made me smile. You look like a little boy. You always treat me like a little boy, Howl Jeon.